Thanks to the many birders who submitted checklists in the Kirtland’s Warbler Migration Blitz research project. In Ohio, we had a little over 300 hotspots (KIWA-OH-survey) set up to accept checklists for the project. The research project is complete and a paper has been published with the results. 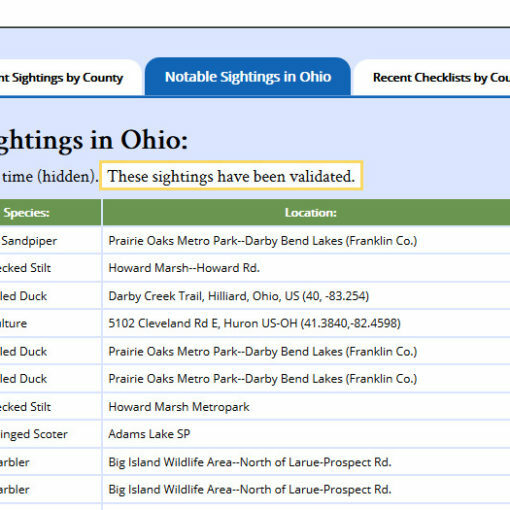 The survey hotspots have been retired from eBird. + A little over half of the hotspots (160) had no checklists and have been deleted. + in just a few cases changed to a personal location shared by those who submitted checklists (6). The new hotspots created from former KIWA-OH locations are listed below. Caesar Creek Lake Wildlife Area–New Burlington Rd. Alum Creek SP–Africa Rd. @ Plum Rd. Resthaven Wildlife Area–Carson Pass Rd. LaDue Public Hunting Area–Aquilla Rd. Paint Creek Lake Wildlife Area–Centerfield Rd. Paint Creek Lake Wildlife Area–Cope Rd. Paint Creek Wildlife Area–Burgess Rd.